Utilimarc has released a new report detailing operating costs and other benchmarking statistics for the Toyota Prius. Data from the company shows that operating and fuel costs for the hybrid car are much lower than gasoline compact cars, but fleets seem to be favoring gasoline-powered compact cars more in the past five years. The data comes from 60 of Utilimarc’s utility and municipal fleet benchmarking clients and their active Prius vehicles. The sample compares nearly 5,000 Prius cars with nearly 11,000 other active compact cars such as the Ford Focus, Honda Civic, Chevrolet Cruze, etc. Average operating costs (excluding fuel) for gasoline compact cars rise as the units age, but costs for the Prius fluctuate much less. Across 10 years, these costs increased by $28 for 1,000 miles for the Prius, or 35%, while for the other cars, this increased by $213, or 211%. This graph shows the operating cost (all parts and labor) net of fuel per mile for the Prius vs. other compact cars by age. The overall trend for both the Prius and the other compact cars is that the operating cost per mile is increasing as the vehicle ages. Fuel costs for the Prius average $82 per 1,000 miles across 10 years, while the cost for other compact cars is $142. This graph shows the fuel per 1,000 miles for the Prius vs. other compact cars by age. The cost of fuel for the Prius has remained consistent as the vehicle ages, while the cost for the other compact cars in the class has varied as the vehicles age. Prius cars are more utilized than other compact cars. Between 2010 and 2014, the Prius was driven on average 1,702 more miles annually than other compact cars. The hybrid vehicle averaged more time between unscheduled repairs than other compact cars. 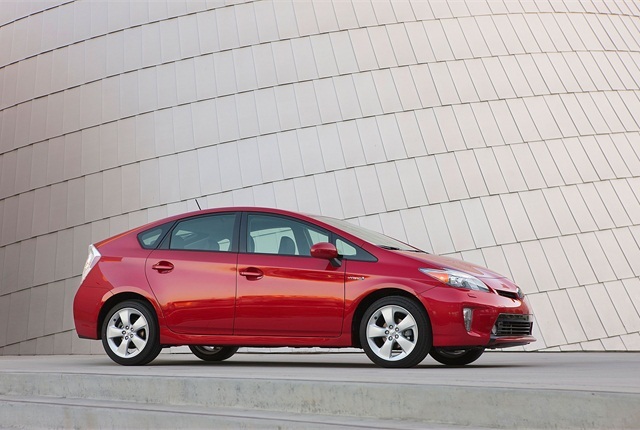 The Prius averages 43 miles per gallon (MPG) between 2010-2014 while other vehicles average 25 MPG. The average MPG of other compact cars is increasing, reaching about 27 MPG in 2014. 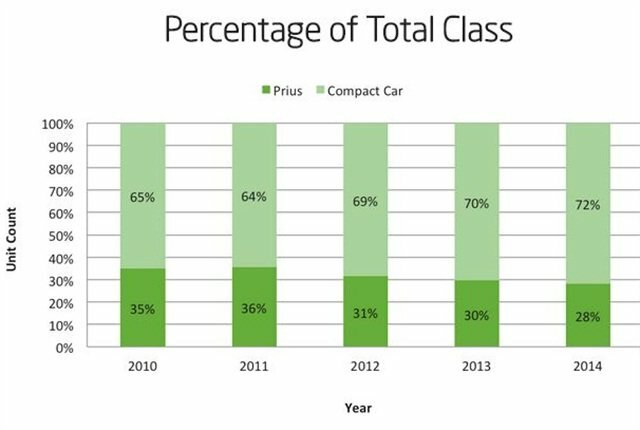 Finally, Utilimarc’s data shows an overall trend of the Prius making up a smaller portion of the compact car class each year, starting at 35% of the class in 2010 and ending at 28% in 2014. This graph shows the percentage Prius vs. other compact cars from 2010 to 2014. The overall trend is that the Prius is making up a smaller portion of the compact car class each year. View the full report for detailed information and additional charts.